← Unreal, Unity, pick one or pick none? Prior to Hyper Void's first PS3 release, we had an interview with Le MooQC; a Montreal local game development magazine. The interview contained some interesting facts, however it was only published in French. In this blog you will find the original interview before it was translated to French. Enjoy! P.S. You will also find the published French interview attached at the end. How did you know that you wanted to develop games as a job? As brothers, we’ve always enjoyed playing computer games together since the 80s. But I must say it was dad who really pushed us out there. He never held back on us when it came to purchasing new PCs, and he used to take us to many of his computer professional friends, who in turn showed us tools to do cool stuff like AutoCAD (the first software we saw a 3D model on), CorelDRAW, and Visual C++. I guess that really gave us the spark, and had us reflect on the games we love and play every day. We were like: yeah, I could use that to make a ship that looks like Gradius! Years passed, and we found ourselves working together at various game companies, including EA. AutoCad. 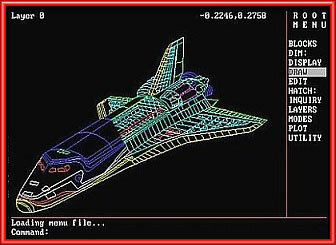 That was the first 3D model we saw on a computer screen ever. Where is the game coming from? Any particular ideas? Did you want to explore a new concept? Hyper Void comes from a collective legacy of a genre that’s almost abandoned nowadays compared to all those first-person and third-person games. But it’s a genre we love so much, and we wanted to pump it up with a unique 21st century take; not just reproduce an HD version of Tempest or R-Type. 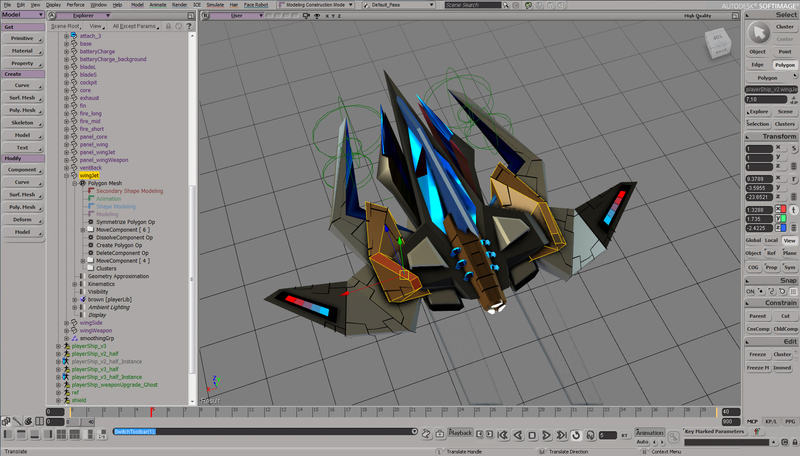 The challenge was to create a modern setting that supports fast twisted 3D shooting action. After some research, it hit us that the wormhole experience was almost always evaded. No one described what happens inside… Thus we came up with the story of a space fighter being forced to survive battles inside wormholes, and that carried for us a lot of potential. Looking at recent movies like Gravity, Interstellar and Jupiter’s Ascending, people seem to enjoy space settings and fiction. Hyper Void was just right there. How did it go in terms of design? What were your respective tasks? With just the two of us, we shared a lot of the design work. Myself (Wessam) focused on the challenges and player experience, while Homam took over shaping the wormholes and the dynamics of the levels. Enemy and boss design was a fully shared effort. Other than design, my role focused on the programming (as well as simpler stuff like sound effects), while the main focus for Homam was the art and all the pipeline behind it, and we were lucky to have our friend Kamel Bushnaq to author the game’s soundtrack. Most of the Montreal Indies develop their games for PC or mobile devices, but you chose the PS3 instead which is infamously renowned to be difficult to work on. Why this platform and was the programming task extra difficult? Well, other than being hipsters ourselves, we felt those markets were so crowded that it’s difficult to get any visibility, especially for our first game ever. As far as the programming goes, it IS difficult… but that’s where our 7-years of experience at EA came in. I’ve already been programming the PS3 for half a decade, so I knew what’s coming. How long did it take to develop your game? One year of full-time, and a bit more part-time due to new dad’s responsibilities. Each of us had his first son during the project. 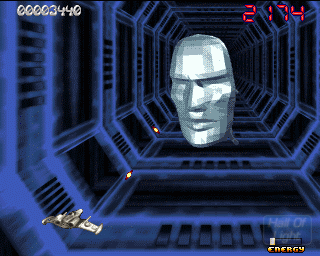 Contrary to most 3D shoot’em up, the player can’t move freely in the level space, was it a deliberate choice? Yes, for various reasons: first, simplifying controls as much as possible. We wanted the game easy to pick-up yet hard to master. Second, the camera setup reduces the ship’s size as it gets farther from the viewer, so the player will prefer keeping the ship all the way back anyways. The game looks beautiful and yet is minimalist in terms of details, why this choice? You told me you did everything except the music part, who is the third talented person who is responsible for such amazing tracks? How did you know and contact him/her? That would be Kamel Bushnaq. When we were thinking about Hyper Void’s soundtrack, we were looking for something along the work of Andrew “Necros” Sega. We looked for talent in our city Montreal, and were lucky to reach Kamel through his sister (she is a classical musician). His first work on Hyper Void was the trailer music, which blew us away and we directly signed up to do the entire soundtrack for the game. Kamel’s work had that touch we were looking for in Sega’s work in games like Crusader No Remorse and No Regret. Do you have some development trivias for the readers like funny anecdotes and such? The game’s main menu backdrop was designed by Homam way before we even thought about how to visualize wormholes across the game. 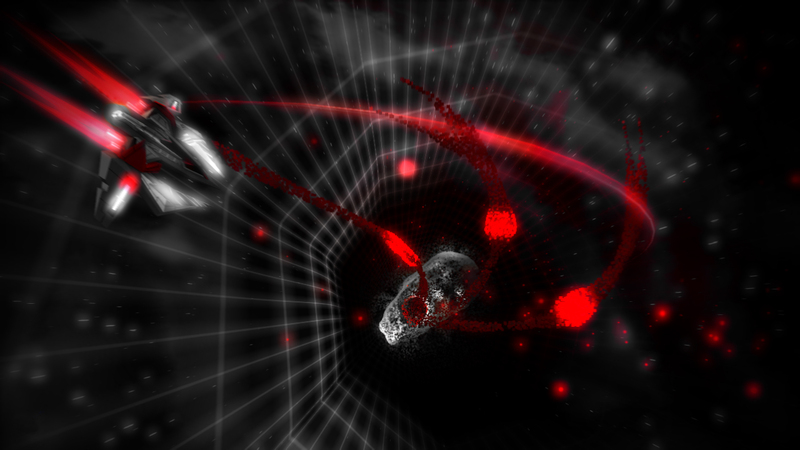 The result was so inspiring that it actually drove the visual design of wormholes in the game. The Super Nova explosion that spawned the enemy virus is named SN-2960rda following the scientific naming convention. It stands for Super Nova event year 2960; about 3 centuries following the days of Wing Commander. 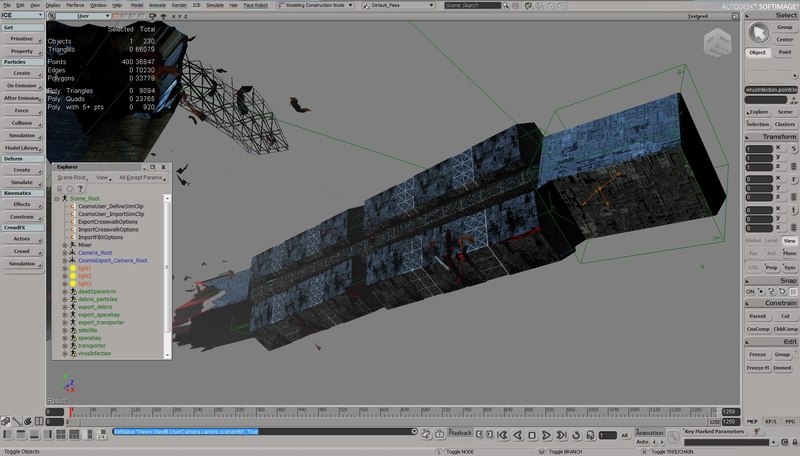 The ship wreck in level 09 belongs to the Lexington from Wing Commander 4. One of the quotes in the story mentions “cats and insects”. The guy is referring to the Kilrathi and Nephilim races (from Wing Commander). The first in-game message is the first line you will learn in any C++ programming book. The premise of the game is that in the future, people got so connected to machines that they speak a common language, and that is machine language. When you destroy Apokrone_22B in level 03, the message “EAT ELECTRIC DEATH” appears. Tempest players should recognize this. Ship name RM-24 is short for “Recon Mission member 24”. According to the story, there are 26 total ships sent to investigate the virus. You play number 24. Hyper Void was designed originally with 30 levels. However, due to time constraints we shipped 29. We had to drop level 26, in which you encounter an infected member of your mission (RM-8) and fight him in a duel. How did the game performed commercially speaking? Did you have any feedback from the players? Is a sequel in the works or is it a one shot thing? Will the game be released on other platforms? Generally speaking, we’ve got positive feedback and download numbers. However, we under-estimated the value of the demo version. And many people were upset with how short it was. We are addressing this now in both the PS3 (through a patch) and PS4 versions. The new demo will have 4 full levels including epic boss fights. I think that beats out any other demos out there. As far as the sequel goes, that is yet to be determined. We are waiting on the game’s releases in various regions on the different platforms (PS3, PS4, Xbox One and PC) in order to have the full picture before deciding where our next effort goes. How did it go in terms of financing? How did you finance your development? We financed ourselves 200% if I may say. We were spending from our savings for the entire development period, which was a big pressure of its own. Still, we preferred this over going to a publisher and sacrificing on creative control. There were some government-funded programs, but the major ones had a cost of their own both in terms of time and money. So we settled with smaller local incentives which did not impose a lot of pressure or restrictions, but they didn’t cover more than the price of the PS3 devkit and a couple software licenses. Now that the game is released, what look do you have on your game? We’re quite proud of it. We look at it and think: for the work of two only, that’s quite an accomplishment. The entire experience was so satisfying especially with no publisher holder a stick over your shoulder. And to my personal surprise, I actually do enjoy playing the game, especially levels 14 and 27… Too much adrenaline! What were your inspiration? Did you ever play Super Stardust on the Commodore Amiga? Because the gameplay and boss look really similar to the one you showed me during the MIGF. Unreal, Unity, pick one or pick none? The reasons why INFramez uses an in-house engine. IN|Framez Blog - Copyright © 2019 IN|Framez Technology Corp.